Hola! What the Fish! It's just 6 alphabets yet! But am I having a ball? You bet I am. Another one from my treasure trove. F is for Friends Forever. Letter F: Fruit "The Dole Whip turned out to be a soft serve pineapple ice cream that was absolutely orgasmic, a word that I hadn't used or experienced in ages..."
Challenge is going F'ing great!!! F is for Favourites and Fascinations - as I explore Amy Krouse Rosenthal's guided journal "Encyclopedia of Me"
The only Irish ancestors in the family - here they are! It's Day 6 and i could literally hear the Nashik Dhol (the Indian Drumroll) in my ears when i published my article today! ;) It's already nerve-wrecking! The theme of my posts is SHORT STORIES. Do read and enjoy! The legend says that if you die at the Pitfall Point, your soul is trapped there forever. Continuing with places associated with my family history. I had always read about family members fighting on opposite sides in the English Civil War and I was interested to find it in the case of my forebears. This is the message I'm getting when I try to paste a clickable link here, second time this is happening, not sure why? Hi Nilanjana, I had the same problem but a friend pointed out that I had an extra space in the syntax it occurred because I had been cutting and pasting the URL in to the message. I didn't see it because I was looking for a wrong letter rather than an extra (almost invisible) extra space. Just a thought. I'm really very sorry about the number of bloopers above, but I am having mega-trouble trying to get my link to work. I have followed the instructions...to no success. I have a shiny new MacBook Pro and I am about to throw it out the window! when you click my links, you just get the message: "Sorry, the page you were looking for in this blog does not exist." Perhaps the problem happens when you try the clickable link? It's so easy to get it wrong! For today, just use the URL as above. It's a nice post and I've commented. Thank you so much, Sue. I'm pretty low on the IT rank! I tried to leave a comment on your site, but it's not showing. I love femme fatales! We all need a giggle now and again and Amble Bay's the place to enjoy one! Today we are off to the Fish Inn for a drink! In today's blog I tell you about some of my favorite things. F is for Floating Skyscraper. Yep, you that right. Floating skyscrapers!!! Tupeak Hope -- Blogging about chronic health issues, patient self-advocacy and empowerment. Post: F is for Keep Fighting! Think beyond your job, marriage and children. Find yourself. F for Nana's Fab Fur Fashion. F for 'Blogging famous' and how you can be famous too! It was a bit difficult to choose today's painting but I finally did it! Today I indulge me from third grade as I review Fantastic Mr. Fox on Wolf of Words. It is part of the Getting to Know Me initiative. 100 words verse story every day. Deb from Pen In Her Hand blogging about Novels for Young Adults. F is for FEED (but it may not be what you think). If you like novels for young adults, please drop by! Here is my entry for today. Can't wait to read everyone's entries for today! 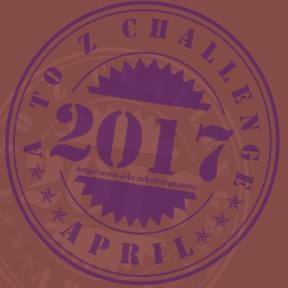 Today's #AtoZChallenge fitness post is all about fun even though we're also talking about fats - good and bad ones. A visit to the Falls of Foyers which are beside Loch Ness. F i s for freedom ..redefined. Two pieces that caused me to rethink and redefine freedom.. If you can find an elusive fern seed, you could become invisible! F is for Flower Part Six of my continuing detective story. I am Narinder and my blog is titled "Create Your Best". Ever wonder how stars shine? F is for Fusion, brought to you by the resident Citizen Scientist. Her Grace is also known for writing novels. What's this it's Friday so soon? Don't freak out, stop in for my latest Art Sketching Through the Alphabet post featuring the letter "F" for fence, frog, fox, and funny face. What "F" things should I sketch next? Letter F: Flags. What a variety! It's Friday Flash Fiction day on my blog. Enjoy! A famous Canadian writer you've probably never heard of. Amazing Andamans And my 6th post is about the diverse Flora and Fauna of the Andaman Islands. Hello! My F post has to do with Fear of Failure and possible Flood Fun. who portrayed the Duke of Wellington the best! F is for Freebies! Who doesn't like free LEGO? A Maine Vanity Plate for F and a poem. Here is a link to my post for F from my blog Weekends in Maine. Thanks for visiting! F is for Flight Deck Brewing| We love (really love) our craft beer in Maine. Today, I keep FANTASY alive. F is for Friends & Foes | A post featuring my casual outfit and a bit of fun! Do you fear to fail? Here's a short poem about- Why we shouldn't fear failure. F is for Fences, a movie review. The list gets shorter every day. But I'm still here. Back in Belgium today. It might not be pleasant, but they call it home. Letter F! Are we having fun yet. Today’s topic: Forests, Foxes, and Frogs. Letter: F is for Favorites! F is for Fear. What if you had no fear? Talking about writing First drafts at Story Dam. Happy Friday everyone! Today I have a story for the letter F is for Fascinating. Please stop by and let me know what you think. Ah the passion is dying down or the Fatigue is setting in. I almost forgot to list my posts this Friday morning. At comment 178, Letter E, here I come. I meant letter F, it's a copy and paste kind of thing. TGIF! The theme of my posts is SHORT STORIES. Do read and enjoy! Letter F : Disaster strikes! Fire! Move to La Yacata! Another quick and fun haiku puzzle for the letter F. What's the word of the day? Come find out at WordWacker! For is for Forward-Thinking Looking into the future with strategic planning! Less lighthearted today. It's about fear. The Underworld (and ancient Greece) hath no fury like the Furies. Percy here! We'd love it if you visited us to find out our favourite things.